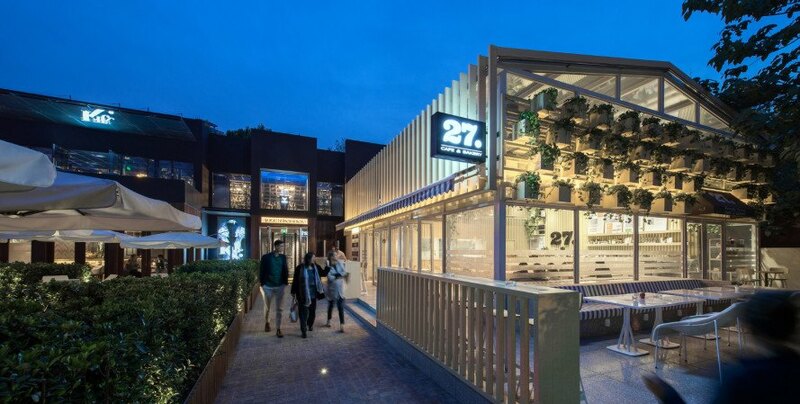 Cafe 27 in Beijing, a devoted organic eatery, received a green makeover in more ways than one. Designers at Four O Nine transformed the previously drab building into a space with multi-layered facades and plenty of greenery adorning the walls. The plant life helps brighten up the cafe while pumping out fresh oxygen for visitors. These features, in addition to the greenhouse shape of the restaurant, create a closeness between patrons and the origins of the food on their plates. It is clear that the design is meant to exude openness, as bright windows are featured throughout the building and ash batons are used as backdrops and room dividers. The seating area features elements for energy efficiency. 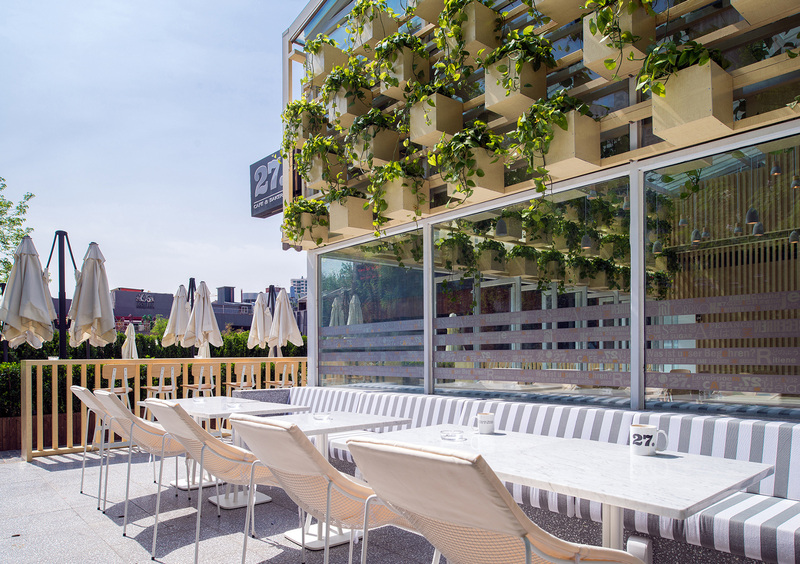 Kos explains, “The combination of the terrazzo flooring and ceramic bar creates a thermal mass that gradually and passively heats the space in the winter.” The team also overhauled an adjoining building, adding a terrace, new facade, and beautifully manicured landscaping. Cafe 27 has become quite a lush, inviting destination for health-conscious diners. The green theme of the restaurant was no accident, as Four O Nine architects were inspired by the cafe’s mission to serve healthy, organic fare. All food is prepared on site in the pastry kitchen and the new look embodies the “farm to table” theme. The team also overhauled an adjoining building, adding a terrace, new facade, and beautifully manicured landscaping. Cafe 27 has become quite a lush, inviting destination for health-conscious diners.